I’ve got a little bit of a love affair going on over here with vintage valentines. You know, the kind you gave away to the boy you had a crush on in 2nd grade. 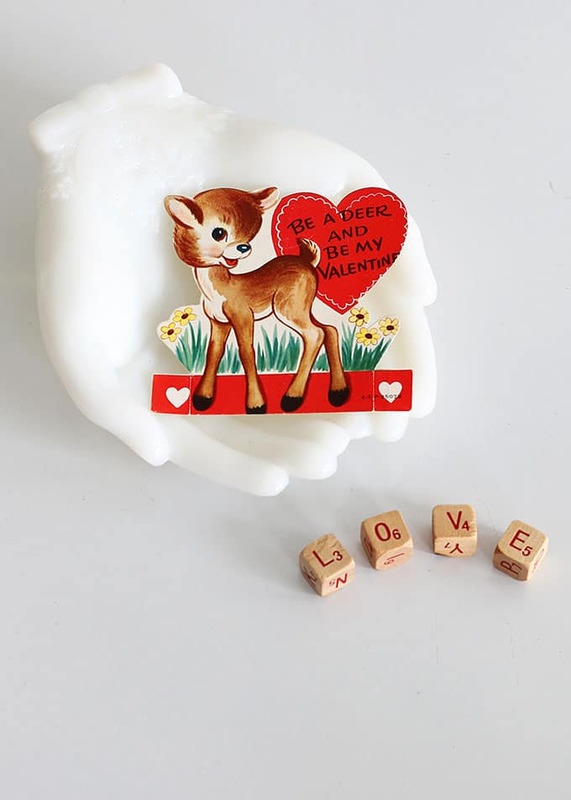 You’d pick out the prefect little valentine for him, write your name in your best cursive handwriting on the back and slide it in the little homemade valentine box on his desk. And hope he slid an equally thought out valentine into the box on your desk. And not one that his mom had filled out for him. If you got a truck valentine you knew what that meant. Well, the other day I ran into a whole boatload of vintage classroom valentines at a local antique/gift store. I must have stood there for half an hour flipping through each valentine searching for the ones that spoke to me. Cute ones. Romantic ones. Cheesy ones. Pretty sure the shop owner was about ready to throw me out. But other than hoarding vintage valentines, sometimes it’s nice to actually display them. 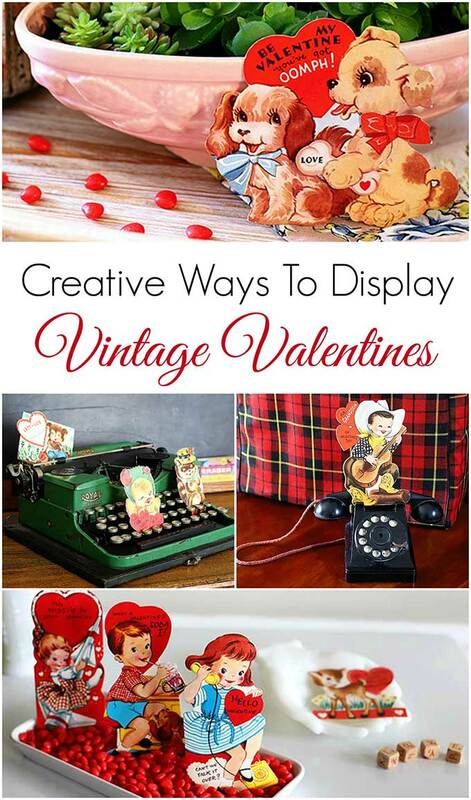 If you share a vintage valentine affliction like I do, here are some ideas of how you can display them! Tuck them around the house. This is my favorite. You’ll see valentines tucked in all sorts of odd places in my house! Use vintage flower frogs or place card holders (like you would use at a fancy dinner party) to prop them up. A quick and easy garland can be made by using small clothespins to clip them to twine. Just paperclip them to a metal wreath form and you have an instant Valentines Day wreath (for indoors of course). Those little cinnamon candy hearts are a good way to stand them up. 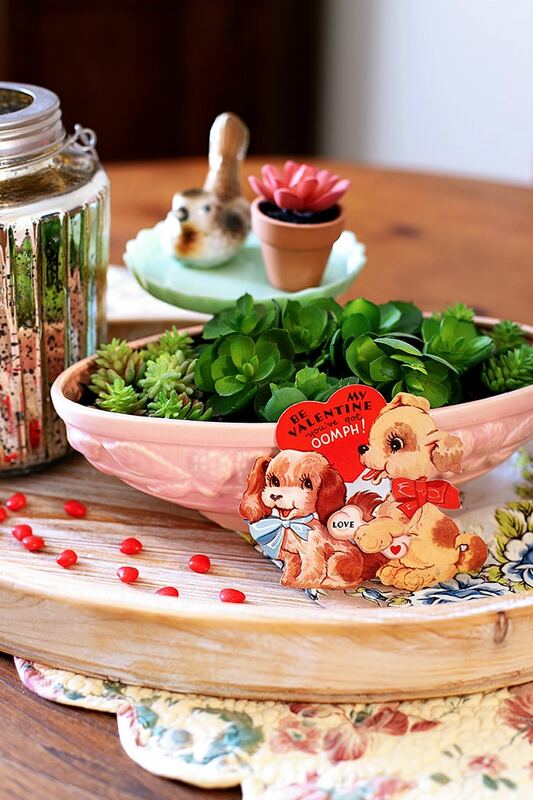 You can just simply fill a shallow tray with the hearts and plop the valentines in. However you display them, remember that a little girl or boy in 1954 took great thought into picking out THAT valentine! Who knows, maybe the couple got married, had 5 kids and lives right down the street from you! 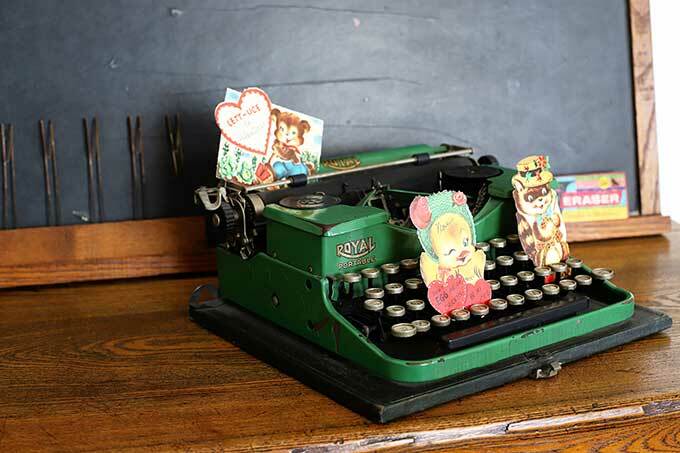 What’s your favorite way to display vintage valentines? Linda at Itsy Bits And Pieces displayed hers in a cute repurposed frame. Diana from Adirondack Girl At Heart showed how she made a simple Valentine banner. Sarah at Sadie Seasongoods shows how she repurposed an old rug beater into a cute as a button display item. 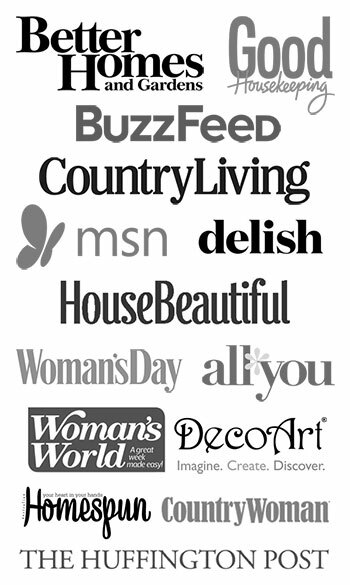 OH I love all of these ideas! Love , ;ove, love! And thank you for the sweet shout-out, Pam! Happy Valentines Day! You always have the best vignettes for the holidays! 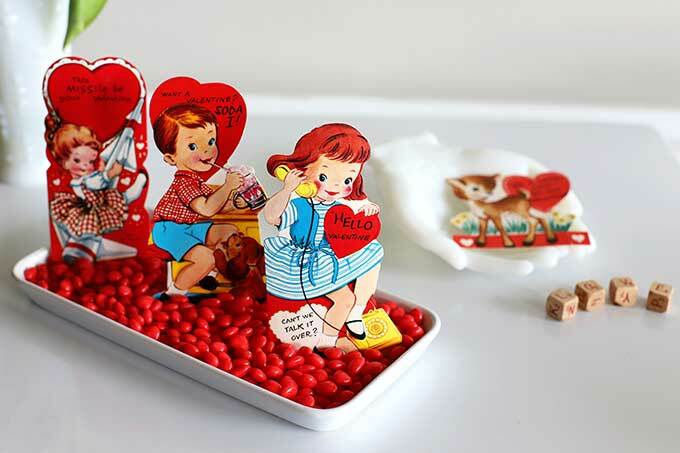 Those Valentines in the red-hots and white tray are adorable! Thanks for sharing! Great ideas! I love how you used red hots to anchor a few cards for display. Thanks so much for the shout out, Pam!! 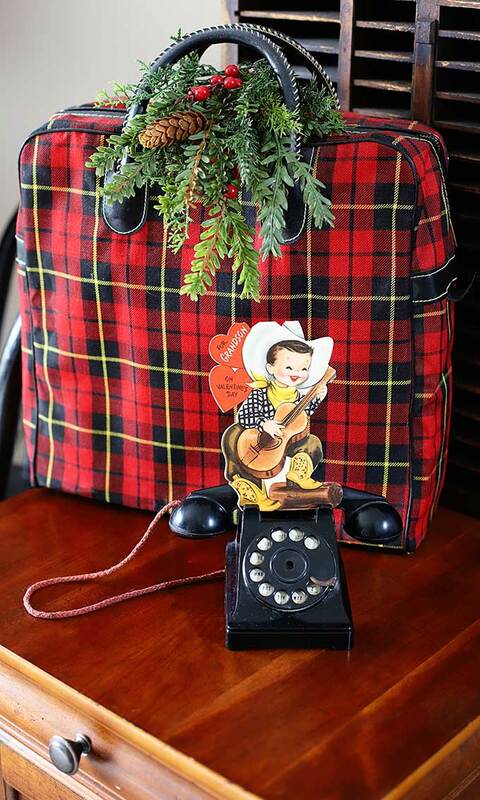 LOVE all of your Valentine displays, especially the cowboy on the phone up against the plaid thermos(?) bag! 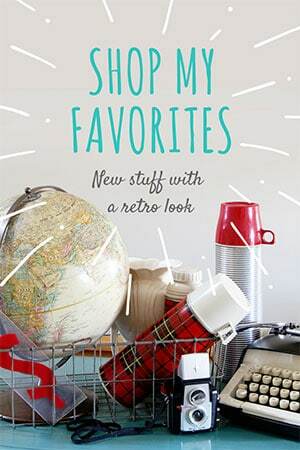 You have the cutest vintage stuff. I love these so much! I absolutely LOVE this idea! How sweet of you!